Contribute to the stumpage report! This information is meant to be used as a guide only. Use with care. Prices paid for standing timber (or "stumpage") can be influenced by many factors, including but not limited to: timber quality, distance to market, accessibility of property, sale volume, market demand, season, skid distance, landowner requirements, method of sale (e.g., competitively bid, or directly negotiated) and logging costs. 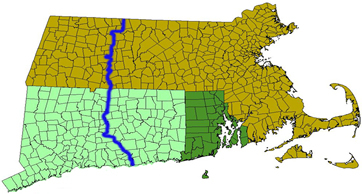 This survey is a result of joint efforts of Cooperative Extension at the Universities of Massachusetts and Connecticut,and the state forestry agencies in CT, MA, and RI.